Spello, which is not far from Assisi, is definitely one of this area's most precious pearls. In fact, Spello is a member of the "Borghi più belli d'Italia" [Most beautiful Villages in Italy], an association that only includes small towns which have preserved the perfect architectural harmony of their monuments and works of art. The town is built entirely from the pinkish limestone of the mountain it sits on: as the sun goes down the entire hamlet gleams with an extraordinary pink hue that gives a particular light to the houses clinging to the hillside, the roofs and the ancient walls. Surrounded by it's fortress walls, in its narrow lanes, baskets of flowers hanging off the windowsills and doorways, with characteristic tower houses and lively squares reminiscent of ancient times. Just a few steps away from the house is the main square with various services, famous wine shops, stores selling local products and many excellent typical restaurants. 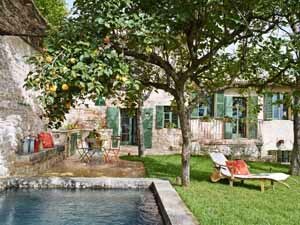 This lovely restored home was formerly a simple stone house on the edge of Spello's town walls. The space has been redesigned and restored in a fresh contemporary style. It is filled with an atmosphere of complete relaxation, which can be felt, in particular, in the luxuriant garden which is permeated with the fragrance of aromatic plants such as rosemary, sage, verbena and thyme, all typical of the Mediterranean area. The wonderful panoramic view of the Umbrian hills is enjoyed from this lush private garden with pool, where traffic and noise are distant memories; your eyes see nothing of the modern world - only the Italian landscape at its very best. A light and airy open space; practical and unfussy but pretty and perfectly furnished. On the right, the kitchen and dining area (table for 6-8); to the left a comfortable sofa with old linen and beautiful pillows opposite a flat screen television concealed behind an antique door. The floors are a soft grey resin and the accent color is green. Chic, cheerful and modern. The master bedroom commands a wonderful view on the garden and the Umbrian hills. The colors of the Moroccan rug rhyme with the red king size bed from Minotti, and the curtains are made from fine Indian cotton. Ensuite bathroom: modern, simple, chic with double shower, bidet and WC. The second double bedroom furnished with a king size bed from Flou and charming bedside tables from Gervasoni. The yellows and greens dialogue with souvenirs found in Laos, Cambodia and Burma. Within the room is a fully equipped shower room. Being able to step out of bed and into the garden is a real treat. The third double bedroom that embodies the spirit of the Aeolian islands echoes in the deep blues and the rich textiles, paired with cool white walls and an old cotto floor. King size bed with en suite bathroom with double shower and antique marble sink. Beautiful view on the garden. Security deposit paid cash euro upon arrival. SERVICES: Wonderful restaurants and shops are all in the village of Spello.